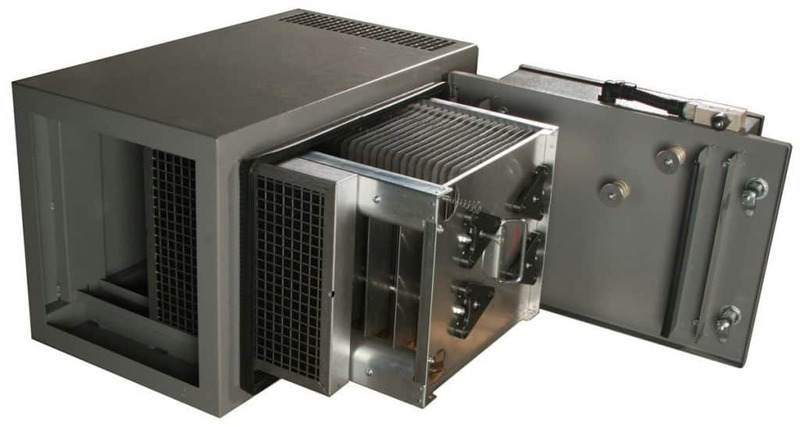 Push-Pull Media Type Systems– These air cleaners use disposable filters and are normally used for dust control or where combinations of dust and mist are present. Cost per CFM is very low when compared to an electrostatic system. Wood shops, auto body, and welding shops use this type of system. Buffing/grinding rooms can also be effectively ventilated using this system. The 40% efficient pre-filters may need replacement every few weeks, with the 95% efficient bags going for several months to a year. Push-Pull Electrostatic Systems– This style is used in much the same way as the media filtration system, but for smoke and mist. 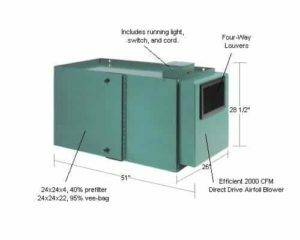 Electrostatic filters will drain when used in areas where mist or oil smoke is present. Maintenance requires a periodic dip cleaning of the cells, normally every 6 months. Results are typically an 80%-90% decrease in the overall level of airborne contaminants. Initial cost per CFM is higher than Media systems, but electrical consumption is significantly lower. Ongoing maintenance cost is also lower because filters are cleaned rather than being replaced.